Hair styles often get old after a while. You go to the salon or sit in front of a mirror for hours trying to create that perfect style. Natural hair is a little different when it comes to styling because there are so many different types of hair and sooo much of it!!! Many people have a certain look they are going for or even want it to look presentable for a specific job or function. Some may get discouraged or just tired of trying to think of a cute likable style. Well I have a easy, funky but cute style that may work for you. 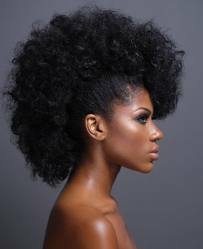 The FRO HAWK is a style that can be easily done, very neat for work or even made funky for an after work event. Its nothing a few tuck combs, barber pins, and some product couldn't handle. A few easy steps can have you ready for the workplace or out the door for a friends get together depending on your mood for the day. This is just another style to add to your KB natural hair diary of trends, tricks, and tips! 5. You can brush your sides up as high as you want them or as low as you would want them. Depending on the effect you want. This style was done with just a spray bottle, some cantu shea butter leave in, 4 tuck combs, and some echo styling gel for my sides.